Much of today's Substation Equipment (breakers, transformers, switches) owned by utilities was installed a great number of years ago and may be reaching the end of its service life. Because of the risk of failures, this older equipment requires higher frequency maintenance and scheduled outages, which reduce system availability and reliability, decreasing the value of the delivered services. Although simply replacing the equipment may solve these problems, the associated cost is prohibitive. Asset management continues to be a challenge as utility companies balance an aging infrastructure with new smart grid technology. Asset management is without a doubt one of the most difficult occupations in the utility industry. In order to remain competitive, maintenance work must be performed at minimum cost and with little interruption to service, all without neglecting safety and environmental concerns. This dilemma creates serious problems for those charged with the responsibility of maintaining utility assets. The current state of the industry has challenged the traditional system of scheduled, or time-based, maintenance. This is the most expensive form of maintenance and it may not identify potential failures. Scheduled maintenance may identify the condition of the equipment at the time of assessment, but the estimation of remaining life is not necessarily addressed by current tests or practices. It is clear that the maintenance process must evolve with the industry. With the Zotera Insight Platform sensors, cameras and other embedded technologies can feed valuable performance data in real time. The Zotera Insight Platform uses advanced analytics capabilities made possible with machine learning identifying patterns found in immense amounts of collected utility data allowing utilities to conduct preventive and predictive maintenance before a problem occurs. 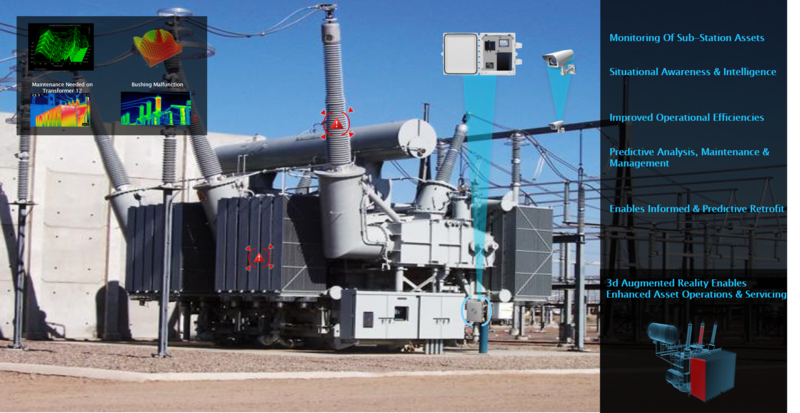 Utility substations present many unique challenges, ranging from theft, vandalism and safety concerns to complying with increasingly enforced regulations related to Critical Infrastructure Protection programs. While the threat of terrorist activity to disrupt the nation's power grid remains ever-present, other hazards such as theft and vandalism are more common and represent an immediate challenge. With the price of copper at an all-time high, and with a large amount of copper wiring present at electrical substations, it's no surprise that they have become an attractive target for thieves. When protecting these critical assets, a real-time awareness when an intrusion is taking place is critical to ensuring a timely response and preventing an incident from escalating.